One of the beauties of doing a residency is the ability to break out of the constant, re-assess, break habits and see more clearly. Most residencies are situated in far away places, however major beehives of art industry always buzz 30 minutes or a train ride away. 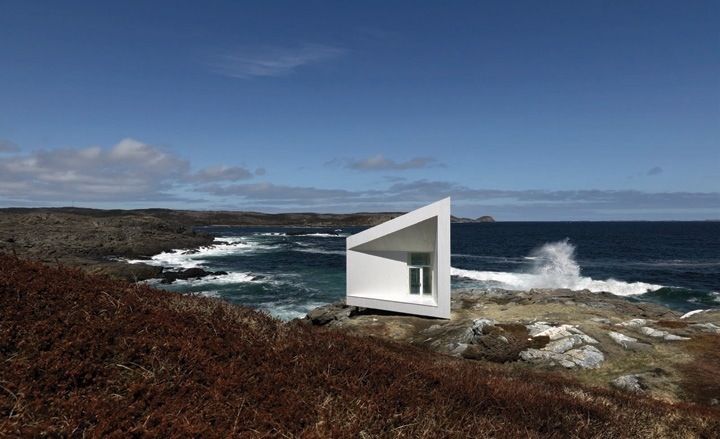 Fogo Island, a small fishing island off the coast of Newfoundland is now home to a very exciting project for artists. Fogo Island Arts Corporation has been building beautiful artist studios, not to mention a hotel, and restaurants to support the new community of artists, not to mention creating new jobs for the people of Fogo Island. The founder Zita Cobb was a resident of the island who left and became one of Canada’s highest paid executives. She has worked for Canadian and American companies, and is now focusing her attention on this project in her home town. The buildings being designed as artist studios are little jewels in the sleepy and rugged landscape of Fogo Island. I imagine one would be constantly reminded of the state of contradictions we live in everywhere given the architecture’s stark contrast to the land. Unlike a log cabin that blends with the trees, the shapes and materials of these artist studios look more like buoys in a harbor shouting directions (red, right return!). I’m so curious to learn what type of art is made in these spaces, as art is definitely a product of space and place. The last bit I read noted the residencies were 3-5 months in length. I calculate I could do one in maybe 15 years when the nest is empty. Unless of course they entertain family residencies sooner.